Greece has always been a place I’ve dreamt of going, a place I’d imagined would be infused with white and green rounded architecture perched neatly on hillsides, fisherman stringing fresh, wriggling sea urchins from the water to feed to the hungry residents, the warm sun quickly browning the skin of the new arrivals and deepening the already established bronze of the Greek natives. I’m one eighth Greek, too, you know? Yep, that’s right. It’s a small, insignificant amount to many, but to me, I find pride in my ancestry. My great grandfather – my Grandfather’s dad – was born in a Greek village called Stereos (which no one – even now the Greek I now realize – have any clue as to its geographical whereabouts). But it does exist, this Greek village, and my great Grandfather is to thank for its physical wellbeing. As the myth goes, he helped dazzle up the village, as well as its residents, at the hands of his financial good fortunes. Though it was a place I’d dreamt of going my whole life, I found Greece slowly moving down my list of priorities as my time in Europe expanded, perhaps I think, out of fear that I’d be disappointed. After my stay in Thessaloniki, Greece, which is the second largest Greek city after Athens (though not many seem to know much about it) I can say that – in terms of my hyped up expectations – I am technically disappointed. The architecture and picturesque setting I’d imagined encompassed all of Greece quickly proved me wrong (this is actually only present on particular Greek islands). With architecture that was mostly modern (or what seemed like 70’s or 80’s modern) which reminded me of a small town in Florida, or something of the like, I quickly realized this was not the Greece I’d imaged. But I was still in Greece, and I wasn’t ready to be disappointed yet. If there’s one thing I’ve come to realize throughout my travels, it’s that you can’t judge a place – a city or a country – on first impressions. Ultimately, I’ve come to note that getting to know a new place is much like getting to know a new person. You have the architecture, the landscape, the nature, the streets, and the shops – as well as the image of the residents – to make base your first impression of the city on, but you must wait to decide. You must talk to the people, observe the culture and the way of life, taste the food, and walk the streets before you make your judgments. It’s only fair. So I did just that. And on the evening of my first night, I was irrevocably bonded with the Greek people, and their incredibly unique culture. On the evening of my first night, I entertained my first experience with what is known as the “volta.” This is a traditional evening walk where everyone (and their dogs and children and grandmas) come out for a walk along the city’s most popular street or area, which in the case of Thessaloniki, is the boardwalk, past the White Tower and along the Thermaic Gulf until you can go no further, except back from where you started. I was making my way along the boardwalk, starting to feel the anxious and fearful rising of that thing I can only describe as loneliness, though I hate to admit it, which also must be the one thing (aside from a stolen Passport) that is most feared by solo travelers. But I was saved. I was saved by Rex. During the weeks prior in Budapest leading up to my trip, I had a growing urge for the one thing I imagined would help cure my lonely spell: a dog. I’m a dog lover, and though I also hate to admit, I’m somewhat of a careless dog owner. Having to leave my dog back home with a family member when my travels commenced, words can’t describe the regret and heartache I feel to my poor Leo all the way back in Vancouver, Canada. The urge to hug a puppy didn’t leave me, and during my weakest moments, even pushed me to consider getting myself a puppy, though I knew that couldn’t happen and wouldn’t be fair to Leo. I couldn’t be both an abandoner and a cheater. Maybe I’ll start a dog walking business, I’d think to myself, laughing at the prospect of me posting English adds around the streets of Budapest. So I gave up with my dog search in Budapest, knowing a dog bite wound would be a terrible possession to obtain in Eastern Europe, and contented myself with smiles and hellos paid in the direction of the canines of Budapest instead. You can imagine my excitement to see Rex, a little back dog on a leash in front of his family – a mother, a grandmother, and a young boy – wagging his tail and smiling in my direction. My spirits lit up, leaving my growing lonely wallowing in the dust. “Can I pet him?” I found myself blurting without much deliberation. With kind permission from the owner, I knelt down to meet the little guy. He climbed up on to my lap and gave me what would be understood as a dog hug, along with some dog kisses too. “His name is Rex,” the lady said to me. I caught an incredible sunset that reminded me of home, with the sun and sky turning all shades of red and orange before disappearing behind the mountains and the ocean on the distant horizon. I’ve always been a true lover of sunsets, so much so that I’ve come to believe I have a “love thing” for what I consider to be a daily miracle – second only to sunrises of course, which I can only enjoy from time to time when the perfect geographical location is combined with my seldom ability to wake early in the morning. This particular sunset, however, was simply spectacular. On this Tuesday evening, I walked back along the boardwalk, the sky now growing darker by the minute. I was surprised to see children running about, and happy families seemingly without a care of the time of the night or the day of the week. A sea of people seemed to emerge out of nowhere, perhaps to enjoy the many live musicians spaced evenly along the boardwalk for the most ideal combination of acoustics, or perhaps to entertain the idea of popcorn and cotton candy from the many vendors along the way. Reaching the starting point of the White Tower, I sat for a moment to enjoy the music coming from the docked pirate ships in the bay, which I suppose also act as stationary bars when they’re not moving quickly through the bay and being chased by seagulls (which, by the way, I haven’t discovered their intent, though free food and wind surfing are amongst my suspicions). This evening marked my first awe moment in Thessaloniki, which can be contributed slightly to the landscape and the proximity to the water, but is mostly thanks to the friendly and social atmosphere and culture I found here. Throughout the week, my interactions with the locals here only further impressed me, making up for any shortcomings I may have felt in terms of my fantasized ideas of Greek surroundings. The people, I quickly realized, are much much more important to a city than its architecture, anyhow, for the people are what make the place. The people are what help you find what you’re looking for as a lost traveler, and they’re what make you feel much less alone as a solo wanderer. By the end of the week, I felt as if I’d experienced more social interaction in Thessaloniki than I had in my entire two months in Budapest. And it isn’t that people in Budapest are particularly unfriendly, simply that people in Thessaloniki are incredibly friendly. People literally go out of their way to converse with you, calling you over and shouting at you if you attempt to ignore them (I quickly learned there was no need to ignore anyone, as they proved themselves to be very clearly well-intentioned, and I later felt ridiculous for this North American way of maintaining distance). I had several (relative) strangers offer to be my tour guide throughout my stay, and I had locals – both male and female – literally walking me from door to door when I’d ask for directions. I was amazed and delighted that the men and women alike of Thessaloniki offer polite smiles when you make eye contact with them, and I was overwhelmed with gratitude at the selfless help I received from my host when I found myself in a very unfortunate situation. If the landscape and the architecture are the cover of a city, then the people and the culture must be the story. And I, for one, fell in love with the heart and soul of this story. 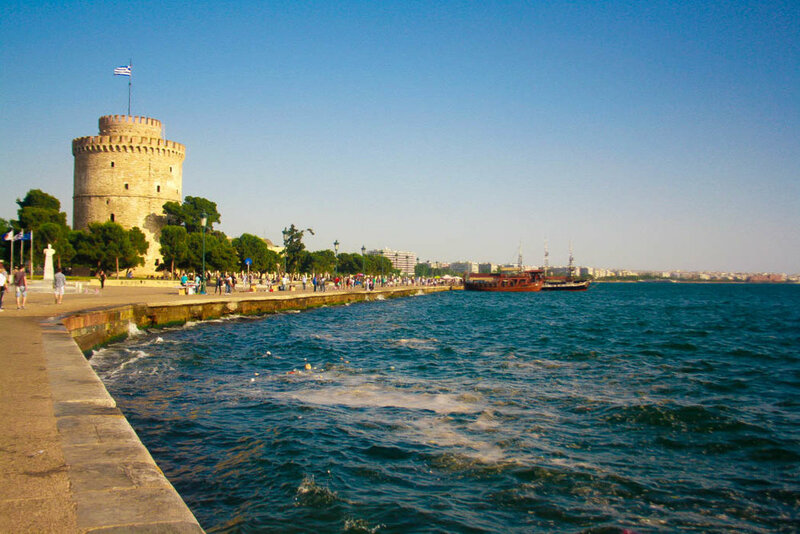 The heart and soul of Thessaloniki.